"BELLY UP TO THE BAR"
And feast your eyes full of these Deletable Moda delights..... (next time I will hand out free slobber rags)....HA!!! So what did I bake from scratch? Not a good picture either (needs to be straightened...).... So in the process of using my scraps from the above quilt, I have baked up my own table runner design.....not such a bad day inspite of my headache from beyond. I did made alot of mistakes, I did tare out alot and I didn't work as fast but hey...it is a done deal!!! All this Moda goodness was curtesy of Inchworm Fabrics. You have your Aster manor by Three Sisters, your Civil War Homefront by Barbara Brackman, and Shangri-la by 3 Sisters....I think I snuck in a Kona bay as well....just love these fabrics and was delighted to put them all into one quilt. I told you the other day I was having the fabric shakes....needed more fabric...sooooo bad (not really, look around my room....no want for fabric here) but....in my mind....I just had to have some. By the way, thanks Mary from Quilt Hollow....you are right, these are so addicting (ooops...there goes that addiction thing again). I did not stop with My Kona fabrics, I started cutting my Moda fabrics as well (all purchased at Inchworm Fabrics). I decided to do two seperate quilts...and use some of my Japanese fabrics with the Kona (that is reserved for another post later)....but for right now.....here is my Moda in a most delicious array of Fabric feast. Isn't it awesome. I didn't want to do a small quilt...so I added more squares and well...I am going to cut out enough for seven more blocks to make it wider. I just love this. So fun and works up so fast. I was able to cut a 3 inch strip off of each piece of fabric to get 4 bowties each. Didn't even make a dent in my fabric. I have used about a yard of white so far. TIP TOE THROUGH THE TULIPS!! I know that is what alot of you want to do...just tip toe through the tulips instead of the snow....soon....very soon you will be. First let me apologize for the picture, I took it between the desk and shelves for my stash, kinda squished in there...too lazy to go to the other room for a picture. Yes...too lazy....that is me. This is out of "Pint Size Traditions II" by Lynette Jensen. I love this...I totally love it.....!!! This speaks me. all of that is NOT ME!!!!! Totally not me, but I did it...yep....I sure did...camping where there were no toilets or running water....yep....I did it. ADDICTIONS - FIGHTING THE FABRIC ADDICTION!! So....you all saw my post below where my one friends is now quilting. She just went on line and ordered a ton of fabric. She wants more....does that sound familiar? I have the bug today, I just took a trip to Green Fairy quilts. Caught my niece online of Inchworm fabrics and begged her for more fabric.....I have never been a junkie before and have never experience the "I need a fix" in that way....but ladies and Gents....I need a fix and I need it now!!!! It is not like I need more fabric (this is just part of the stash)....and the truck is in the shop so there is no running down to the store to just look (ha!!! like that don't ya....just to look...wink wink). What, this too will pass, I am a greedy monger....yes....once again the shoe fits...I am wearing it happily. THIS NEXT POST MAY BE OFFENSIVE TO SOME! Some of you OCD people may want to gouge your eyes out when you see this picture!! So lets talk about this....I have my machine, a project on the machine, my water bottle (I have to make myself drink anything)...I have a book to read while blogging, a to be project under some mailing list (if I put it away it will never be)...my computer, camera, to do list, notes to high heaven, material to list in my store, another project and then behind the computer...all the stuff I dont know what to do with but don't want to put it away where I can not find it. On the floor are two baskets full of material that I am constantly pulling out of the sheves, a pile of unfinished projects, cub scout projects and the list goes on. This tote and quilt was made by my friend here, she is the one that did the quilt along with me also. She actually, came up with this design (even though this design is out there) in her head and over the phone we did the dimensions of each square. She is sharp as a tack and a natural at quiting. This is one amazing gal and this quilt is absoutely beautiful when you see it up close. GETTING READY FOR THIMBLEBERRIES WEDNESDAY SEW DAY!! Last Wednesday of the month, which is this Wednesday. Hopefully, some of you can join us...this is what I plan to work on....hopefully, you can see the picture. Work alittle....chocolate covered macadamian nuts....work alittle more....chocolate covered macadamian nuts.....and so it goes...just doesn't get any better than this. The pattern is Thimbleberries from "Pint Size Traditions II" but the fabrics are yes...you guessed it from my niece's store (except for the yellow fabric)....go on over and take a look. For instance....when you see this delicious Batik fabric.....you just say to yourself.....YUM....your heart races a little, you might have to wipe a little spittle off your mouth... and well.....most quilters know what you mean when you say yummy. I know you want to touch them...smell them...and touch them again..
And then there is the YUUUUMMMMMMIIIIEEEE....yes, these chocolate covered macadamian nuts have M & M's beat by a mile...the only thing they do that M & M's don't, they melt in your hands so you dont have much time between taking them out of the bag and popping them in your mouth..that's right....not much time. I have no problem in that department!! I am used to being on this island by myself when my husband goes away. I am not use to someone bringing me my packages, I just wait until my husband comes home for the mail, but he has partners now. One of the partners brought me my mail and this package was what he brought. My sister sent all of this too me. Funny part, he was talking to me and the whole time I was shaking the package and said...oh....I have candy.....do I remember what he was talking to me about...no....I was like a three year old focused on the candy. Couldn't wait til he left so I could see what it was.... I love Red hots....love them. Noticed that the package is not opened...yes...I restrained myself...it was hard but I did it. Thanks so much Jeanette, this was the highlight of my week..... I went to cub scouts with a red mouth....HA!!! FIRST UFO FINISH FOR THE YEAR!!! Nice and crinkly.....may not be of blue ribbon quality but good enough for me. This is probably the 6th big top I ever made and first paper piece....just been sitting around to be quilted....so I am not too unhappy about it. I really didn't start quilting alot until I went to Texas and even then it was in my spare time since I worked. I was able to crank out alot of smaller quilts. When I was in Missouri I made several big quilts and hand quilted them. I made alot and I do mean alot of baby quilts and throws....so moving to Texas about 6 years ago was the real beginning of my quilting journey....and what a fn journey it has been.....so welcome to my world!! IT IS ABOUT TIME!!! So you say? Okay, first of all.... HAPPY BIRTHDAY TO ALL OF YOUR FEBRUARY BIRTHDAYS. To be honest, I was going to try and list everyone but the fear of forgetting someone was too much and there were 15 February birthdays..... so the person who gets to chose from these dish towels is (the blue teapot is not available)....is luv2quilt. Congrats to her and I really really wish I could send all of you something. So you March Birthdays, get ready, even if you think I have your b-- day....give it to me again. I have my calendar right beside me with 11 birthdays already. The winner of this table runner is...and believe me you, there were alot of points given out....and alot to talley up.... is Miss T.
Did any of you notice that I have 40,000 hits to my blog? It came and went silently....very silently...that is why I chose a silent winner from my post, Drama in the South Pacific. The winner is Terry from Terry's treasures....look at the cartoon she posted on her blog. 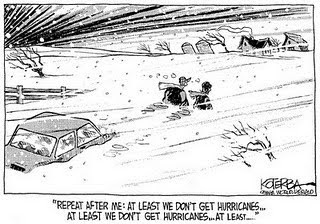 This is just tooo funny.....you all have snow and I have hurricanes....I should be going, at least it is not snow...at least it is not snow. Terry, after the birthday gal for February choses her towel, you can chose one. I don't plan to go to the post office this week, so it will be a while before I send them out...my truck is having probles and well....hubby is off island...so taking no chances. DRAMA IN THE SOUTH PACIFIC!! So we survived a Hurricane. It did go from a level 3 down to a 1 before the night begun. The only thing that was really creepy was the calm before the big winds. We did lose power but for only about an hour and a half, right at midnight. This was what I worked on off and on yesterday. I took everything off the counters and tables incase the winds came in the house (I didn't know what to expect). I have a 72 hour kit in my hallway, food and important papers in space bags.....my machines are in space bags too....So now it is time to clean up. Thanks for your care and concern! First round to the Round Robin is done....now don't think I am fast, I already had the house blocks, I just had to make the trees. The houses are from a BOM that I never finished and knew I wouldn't finish...so...here is to my last years UFO....feels soooooo good. I know, I need to iron it...will get to it tomorrow. This is all Mary's fault from Quilt Hollow....I curse her....she is always talking about schnibbles and how addicted she is to them....hers turn out so amazing....every day...I am telling you, she should sell drugs, she just makes it sooooo irrestible. Actually, she is one amazing person...go check out her blog, awesome schnibbles and quilting. 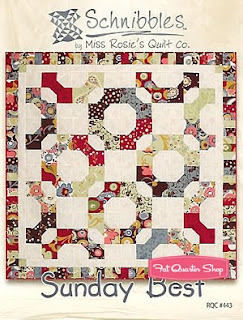 Got the schnibble pattern from Quilt Taffy...they give fast service. So here is my pet peeve.....having to re size a quilt. I hate it....such a hassel...as you can see my flowers are not proportionate to the Giraffe. So frustrating. I tried using our copier...well...I think they turned out pretty good anyways.... By the way, my octopus, it is full size for that main reason....I hate to re size. Well...this is the back view...sorry for the way it is not flat on the table...but gives you an idea of what I am doing. Showing this to you backward...sorry. This is the front...the sash is not quilted yet. I prepped this quilt, sandwiched and the first 6 rows quilted. Most people walk their dog, I am walking a quilt. It is not perfect but I am excited about the way it is looking!!! Also,someone made a comment about how easy the things I make are....I know they did not mean anything by it, I have been thinking about that before the comment...so...I decided to pull this UFO out and walk the devil out of it and show that I can do something a little more complicated. I am coming home MOMMA!!!!! I don't like it when the earth moves.....it is not suppose to move.....and no...I have not been drinking...never touch the stuff but if we have enough of these I just might (only kidding). This is a package from Sew Cal Gal, she has two blogs, one for information and her personal blog and then a giveaway blog. Now there is something I want to tell you about Darlene, she will give you the shirt off her back....she has emailed me on numerous occasions to give me information or help in regards to my pattern and my niece's blog. She is a wealth of information and a wonderful friend. If you have not been to either of her blogs, please go over and say hello. She sent these fabrics and a pattern for my ladies at church. Wonderful huh? More items for the tsunami victims. Now I have been looking over this and am itching to get started on it, it is the Plumaria with the interfacing to help you get started. I am going to love this!! I just love applique and Darlene knows it, thanks so much Darlene!! as you can see by the pictures, these quilts are just awe inspiring. What do they all have in common? They bring me great joy and pleasure. My husband and I went walking along the airport today (which was Saturday), which is by the ocean....and I came home with a few treasures. Don't you just love this coral? Looks like a brain. Look what Pat sent me from A little of this and a little of Pat....isn't she wonderful? She wanted me to make something for my new home and she knows I looooovvvveeee snowmen. Look what I made with your trial block! Used my insul brite....and I looovvvvvveeee it! Thanks soooooooooooooooooooooooooooooo much!! I made the smaller table runner today....with regular batting. I think I know what my problem is...my binding is stiffer than the actual project which makes it wave...I think a few washings will take care of that..... Had a fun day today...the walk along the beach was just what I needed to be rejuvinated.